Kippot Center -Best place to buy Wedding Bar Bat Mitzvha Yarmulke, Kipot, Yarmulkes for Bar Mitzvah, Bat Mitzva & Weddings at the highest quality and discount. Real not cheap Torah Cover Mantels, Parochet kippot, yarmulkes, and Judaica. We Ship In the United States, to Canada, to the UK, to Australia, & worldwide ! 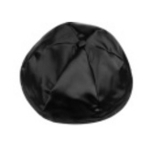 Satin Kippot made of the finest satin material. Ideal for Bar Mitzvah, Bat Mitzvah, or Weddings. Free Imprinting on all orders. Imprinting done directly on lining. Imprinting in silver or gold. Orders ship in 14 business days. Shipping takes 2 - 7 Days.